Ida Rachel Bloom, daughter of David Bloom and Belinda Pearce Franklin, was born in Aug 1857 at Carroll County, Maryland. 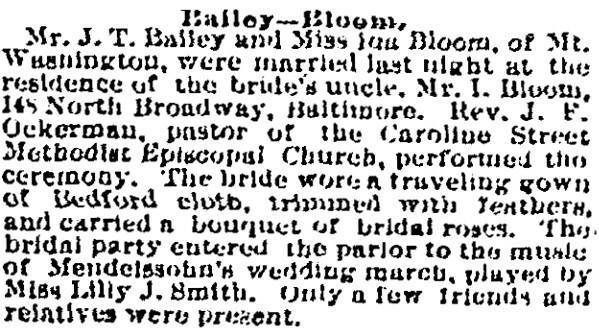 She married John Thomas Bailey, son of Jacob Bailey and Barbara Ann Tracey, on 05 Nov 1891 at Baltimore County, Maryland. Ida died on 11 Mar 1901.